In fantasy, the author takes the audience into a strange and often dangerous land. We want to see that land, to smell it, to feel its wind and temperature shifts. There are so many strange and unbelievable things in this wild country, that we often need a sense of “place” so that we can better follow the story. Maps help tether us to this new land. Maps help us to understand a very foreign place- a land where magic lurks. 1. Clarity- I detest blurry or tiny maps crammed onto a page. Even if I could locate that magnifying glass that’s around the house somewhere, I still won’t be able to find anything on that smug the publisher threw into the front of the book. I know its usually better in the hardcover edition, but really? Does it have to be that bad for the paperback? 2. Applicability- Does the map have anything to do with the story? Are the important locations even shown? No, I don’t mean the major cities or highest mountains. If half the book is spent in a particular town, then you need to put it on the map. Please. 3. Beauty- I love it when a map is a piece of art as well as informative. 4. Sense of Wonder- Can you taste the magic in the map? Does the map add to the fantasy? I have always felt that the Middle Earth maps do that; I can sense how wild and dangerous the lands are, just by studying the maps. The mountains soar high, while the forests brood. 5. Mysterious– Are there other places hinted at on the map? Lands beyond its boundaries or areas that are murky on purpose? I like a map that implies an even-greater world beyond its borders. 6. Believable– I want a map that either follows the laws of nature or has a good reason for breaking them. Do you have a desert next to a rainforest? Well then, I expect the author to have a good story to explain why the rain never makes it to the sand. Do you have radical changes in topography? Then the story should reflect how that influences the weather and temperature and commerce. Do the distances between places match up to what the story implies? There are a few authors out there who should enroll in a basic course on Physical Geography (or at least the artist who drew the map needs that class). 7. Details– I want some intriguing details in a map. I love Ursula LeGuin’s Earthsea map, with all of its tiny islands and their quirky names. The novels and the map work together, creating a richer experience for the reader. I wanted to go sailing around those islands myself, after reading the books and seeing the map. What about my worlds? I have two fantasy series, one with maps and one without. 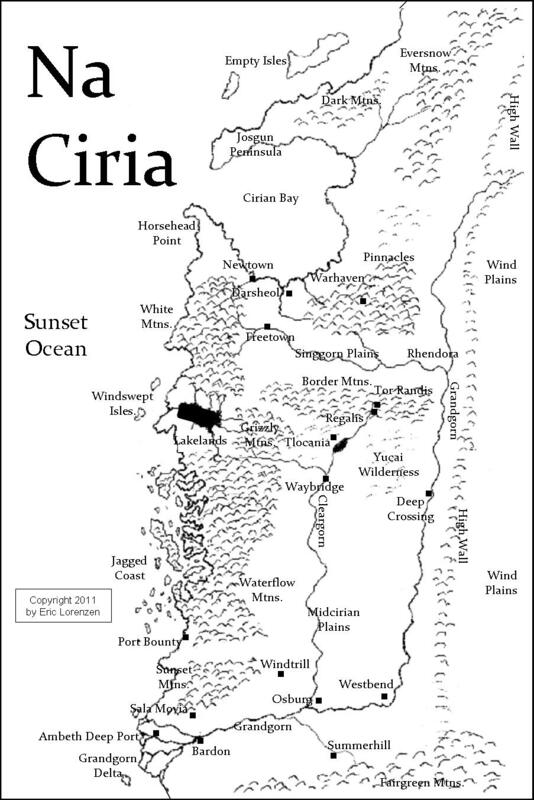 The Cirian War Saga novels actually have two maps each. One it the map of Na Ciria and the other is a more local area (the Border Realm for the series’ first book: FALLEN KING). My map-making skills are modest, but I hope that the Na Ciria maps help readers to better visualize this wild and beautiful country, with its rushing rivers and majestic mountains. For my other series, the Ways of Camelot novels, I chose not to include any maps since the Arthurian legends are so full of contradictory locations and place names. I had no desire to wade into the middle of any of that. Instead, my stories center around a nondescript magician named Thomas and his journeys through the magical routes that lead into and out of Camelot. The first book in that series, ROAD OF LEAVES, stays mainly on that enchanted way and the Road cannot be mapped since it shifts every night. 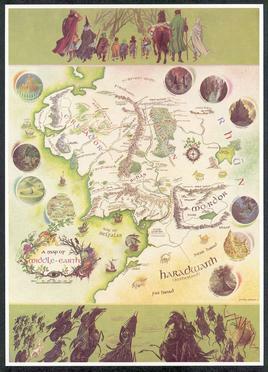 Tags: cirian war saga, earthsea, fallen king, fantasy lands, fantasy mapmaking, fantasy maps, fantasy worlds, middle earth, road of leaves, ways of camelot. Bookmark the permalink.